Within the first few minutes of the Food Wars! : Shokugeki no Soma anime, viewers are made well aware of the extent of its fanservice. If the flavor of peanut butter squid being visually likened to being violated by a large squid wasn’t enough, as the episode progresses characters basically have reactions that are downright orgasmic. It’s the kind of reaction that can really turn people away, but I also am aware of how the seeming need to fully animate a manga can lead to a rather different (and more gratuitous) experience, even when faithfulness to the source material is considered important. This is what I believe happened with another series, Mysterious Girlfriend X, and so when I got the chance to read the manga for Food Wars, I went in curious about two things: the depiction of competition in the Yakitate!! Japan “food battle” sense, and how the fanservice compares to the anime. Food Wars! portrays both the act of master chefs locked in fierce cooking combat and the sexually charged tasting reactions with equal care and attention to detail. The manga is certainly not a cleaner alternative to the anime, but there are a couple of points I noticed about it. First, the manga’s imagery is a noticeably different experience due to the lack of need to fully animate all of the more gratuitous scenes. Second, Food Wars! actually takes a kind of multi-level approach to its fanservice. I think it’s fair to judge a series by the most extreme examples of fanservice found in it, and so this isn’t really a defense of Food Wars! as sticking it to the prudes or anything. However, when it comes to anime and manga, they tend to maintain to a fairly consistent level of the kind of fanservice they want to use. Love Hina and Chobits go for mildly risque bath scenes, Aim for the Top! goes for the subdued-by-today’s-standards jiggle and “creative” camera angles, and Godannar!! and Ikkitousen are all about in-your-face shots and revealing clothing (or lack thereof). Food Wars!, in contrast to all of those, encompasses virtually the entire spectrum. At the far end, you have the scenes described above: images that, in and out of context, look like something you’d find in a naughty magazine. However, there are also plenty of food reaction moments that are more about showing off the girls’ (and in some cases even guys’) bodies in the buff, without that added layer of sexual innuendo. There are images of girls spilling out of their outfits, but there are also relatively more conservative examples. So, while you have a character like Mito Ikumi (pictured at the beginning of this post), who wears bikinis and is based around a rather blatant “meat” theme, you also have characters like Tadakoro Megumi and Mizuhara Fuyumi, who are less voluptuous but are still involved in their own fanservice scenes relative to their designs. In those instances, the manga will decide to show for one panel the way that Megumi’s pants hug against her hips, or that Fuyumi has subtle but noticeable curves. In terms of how men are portrayed (their clothes burst off as they salivate over a five-star meal just as much as the girls do), but I’d actually like an opinion from any readers interested in men as to whether Food Wars! hits any of their buttons in the right way. I get the feeling Takumi Aldini is popular, but I haven’t looked into it extensively. Given all this talk of gratuitous imagery, I find it all the more interesting that the more I read Food Wars!, the less I think of it as a fanservice series, even though it can be so elaborate and perverted in its character depictions. It certainly is still that sort of manga and anime, but the cooking really takes center stage, and in certain ways the ever-present fanservice is actually subordinate to the food. There’s just something about the intensity and the amount of attention that goes into presenting the culinary masterpieces of the manga’s characters that shines the spotlight on their cooking above all else. Last year at Otakon, I debuted a new panel called “Great Ugly Manga.” The purpose of the panel was to show how bad artwork in manga wasn’t necessarily a demerit against that manga, but that “ugliness” could be utilized in interesting ways. Ugly manga can play with expectations, carry a kind of strong emotional energy, and even change the meaning of moments compared to if they were rendered beautifully. This idea is not new, and in fact at the panel we mentioned the essential philosophy behind heta-uma. The idea, originating from Japanese artist King Terry, is that art has a technical aspect and a kind of “soulful” aspect, and that while being good in both categories is the ideal, it’s better to be bad at the technique and good at the soul, rather than good at technique at the expense of expressiveness. In fact, it was while we were gathering images for Great Ugly Manga that my co-panelist I briefly discussed the idea that Rob Liefeld might be heta-uma. Both the notion of bad-good and good art in general are highly subjective, and the line between technical expertise and expert expressiveness is actually pretty nebulous. 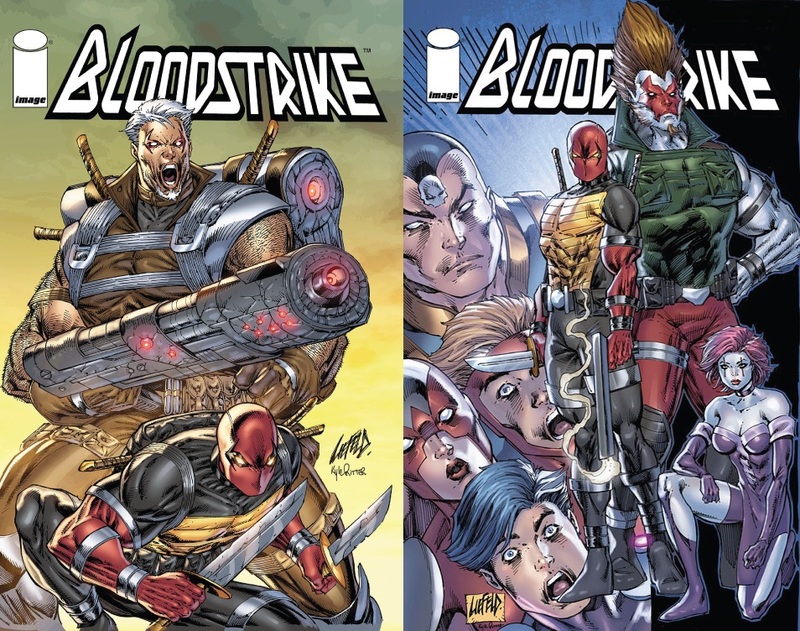 When I talk about Liefeld’s art being “bad,” I’m more using the idea of bad that has been presented online across various forums and articles, that his tendency to use the same poses, to ignore feet, and that his overall frenetic line work is less impressive than artists with similar yet more highly refined artists such as Jim Lee. What I find is that Rob Liefeld’s work can’t be called bad-good in the common sense of the term, nor can it be called any of the others: it’s not good-bad, good-good, or even bad-bad. I would argue that bad-good is perhaps the closest category to fit Liefeld, but doesn’t quite fully describe his art. There are two characteristics of heta-uma that I think is vitally important under normal circumstances. First is the idea that the ugliness of the art has to be eminently obvious. When looking at an image from an ugly manga, there is an immediate realization that something is “wrong.” Second is the idea that this ugliness in term gives power to the page, that it creates a strong sense of energy or awkwardness that draws the reader in. Take the page above from the manga 81 Diver, which is one of the series we mentioned in “Great Ugly Manga,” where the mishmash of large word balloons, bizarrely drawn characters, and unusual situation make the scene stand out. What’s also notable about its artists, Shibata Yokusaru, is that he falls outside of the category of artists who can draw beautifully but choose not to. He has a lack of technique, but more importantly he doesn’t let that flaw get in the way of his attempts to draw complex scenes. By challenging himself, the ugliness of his art stands out even more, which is his charm. And yet, once one gets past that point, and after getting over just how awkward his drawings can be, I find that Liefeld is not so different from Shibata, in the sense that he does a lot of things around his particular style that lend it a significant impact. 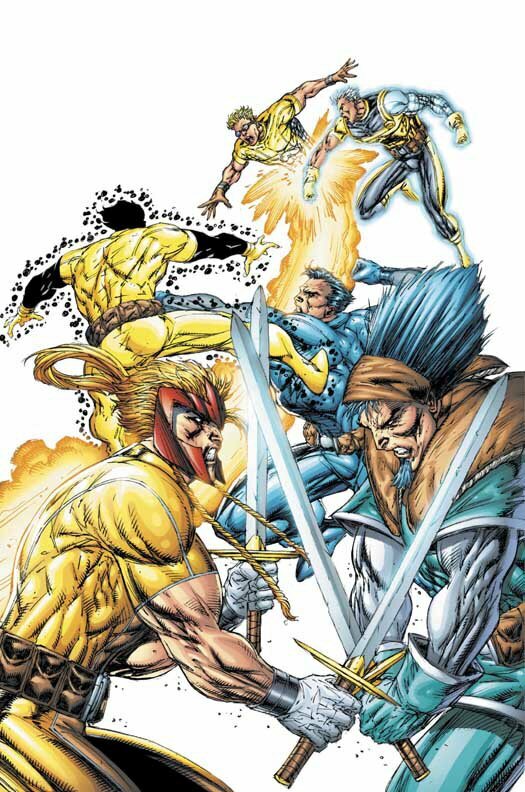 While in some cases Liefeld is known for “playing it safe,” using the same poses repeatedly for example, he also pushes himself to draw elaborate situations designed for readers to in fact examine and re-examine them, such as large fight scenes. It’s in drawings such as those that the heta-uma of his work really shows itself, as while one can criticize the lack of realism in his characters’ musculature, or the fact that perspective doesn’t work that way, ultimately the intensity of the fight shines through. While a more skilled artist could perhaps do a better job and even keep a similar level of intensity, what I find interesting about Liefeld is that the very flaws in his work contribute to the image’s impression of strength and fury. Overall, I think Rob Liefeld is loosely in the category of bad-good, but that he doesn’t quite fit the mold created by other heta-uma artists. However, because the term doesn’t have a rigid definition of qualifying characteristics, and because the idea of good and bad art are so personal, calling him bad-good less a solid criticism or praise of his works and more trying to get into the realm of what Liefeld art is. What I find in the end is that his style creates flimsy yet powerful illusions, and that this is definitely a place where heta-uma can thrive. In the past, I’ve written about “OEL manga,” English-language comics inspired by the manga style, in an attempt to find out why OEL manga often end up looking not quite like what typically comes out of Japan. I’ve brought up ideas such as screentone usage and how it often looks like artists try to draw “anime” comics instead of “manga” comics. It’s not a bad feature, and there are plenty of good comics that are inspired by manga without looking like it, but it’s just fun to try and figure out why things don’t look “right,” so to speak. Recently, however, I’ve come across a manga called Shoujo Fight by Nihonbashi Yoko, and even though it’s drawn by a Japanese person for a Japanese audience, to me it looks very similar to OEL manga. It’s to the extent that, if you had given me a page from Shoujo Fight translated and told me someone from Kansas drew it, I might very well have believed you. Shoujo Fight is a volleyball manga published in the magazine Evening (sister to Genshiken‘s Monthly Afternoon and the popular Weekly Morning). Its story follows a girl named Ooishi Neri, who holds back a fiery passion for volleyball due to a traumatic event in her past. Beginning from 2012 it ran for 12 volumes, and it’s overall just a solid sports manga with a large variety of interesting female characters with equally diverse body types. Now, I want to emphasize that, when I compare it to OEL manga that I do not mean that as an insult, and in fact I really enjoy Shoujo Fight‘s art style. 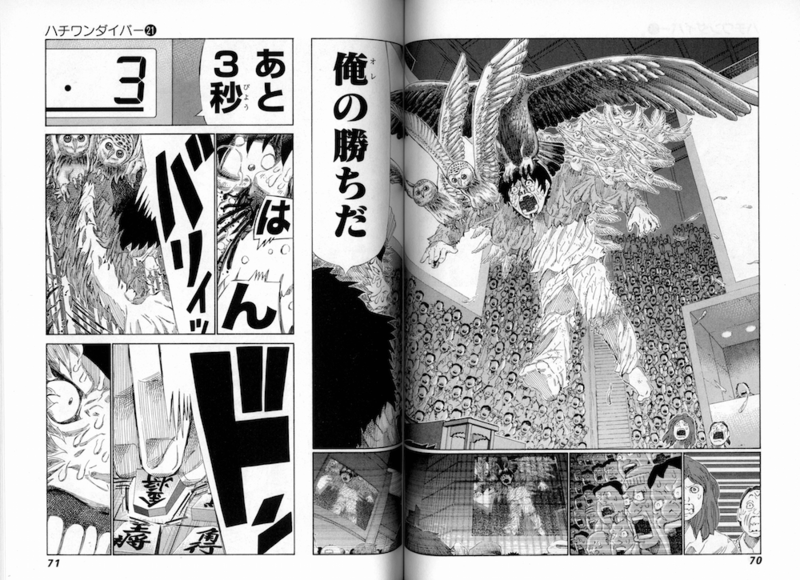 Nevertheless, it does leave me wondering… why does Shoujo Fight look to me like OEL manga? I think there are a number of interrelated reasons. First, the creator, Nihonbashi Yoko, has a very design-oriented and graphic style that’s conducive to posters, symbols, and logos. When looking at her official blog, there’s a lot of work along those lines, and I think she’s very good at it. Second, Shoujo Fight is clearly drawn digitally, and I think (whether it’s accurate or not) that I associate “western” renditions of anime and manga with the rise of tablets and digital comics in general. 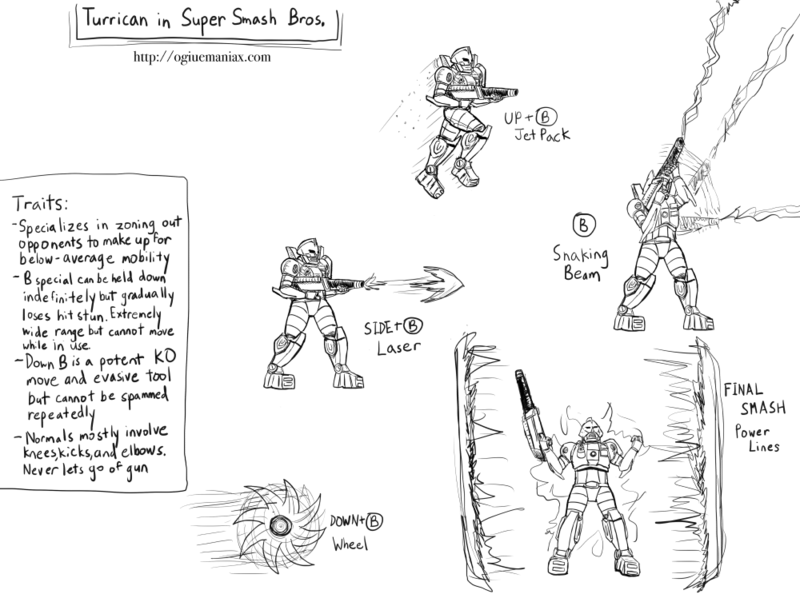 The line work is very smooth and sleek, completely devoid of pen or pencil textures, and I find that a lot of Deviantart artists tend to work similarly. Third, the way Nihonbashi draws eyes often times feels closer to what I’d find in a North American or European comic. In fact, to me the way that the heroine Neri’s eyes are drawn reminds me strongly of the girls from the Italian comic (turned French animation) W.I.T.C.H. or even those of a Disney heroine. I think this becomes especially noticeable when a character has her eyes closed part-way, because the particular shape of the eyes and eyelids are not so common in manga. With Shoujo Fight and its art style is compared to the typical manga, it’s fascinating to me how the idea of “manga” continues to be challenged from both within its primary industry and from the outside. And if you want to see more of her work, follow the creator of Shoujo Fight on Twitter. Viga is a long-time Genshiken ally; we even did a panel about Ogiue together at Otakon! Naturally, when requesting a drawing to commission, there was only one real choice. If you’re interested in her work, check out her Tumblr and Twitter.